If you are on the email redirection list receiving this newsletter, I respectfully request that you forward it on to all your club members in order that they also are informed of conversations that are taking place on their behalf at District level. Thank you, your assistance with this request is incredibly appreciated. I am writing this update on 2nd December 2018, with the festive season almost upon us, and as the majority of clubs take a break over the Christmas New Year period; I encourage you to take time to rest, relax and rejuvenate for the 2019 year. I would like to take the time to officially acknowledge and thank our team of Area directors who, over the past five months, have dedicated their time to visit clubs and write and submit the associated reports on the Toastmasters International website. These reports, 147 of which have been received in this round, enable your District Senior Officers to monitor club progress and identify areas where extra support and guidance may be offered to assist with Club achievements. I take the time now to formally acknowledge and congratulate those Toastmasters amongst us who have achieved the highest designation in the Toastmasters International organisation, that of “Distinguished Toastmaster” (DTM), since the Toastmaster year began on 1st July. This award is achieved through unrivalled dedication, consistent effort and focused commitment. Your achievement in reaching this milestone has not only improved your own personal abilities but has also positively encouraged and supported numerous others around you through natural progression. As I sign off for this month, I would like to wish each and every one of you all the best for the festive season ahead. I trust you are able to take some time out for yourselves to recharge and look forward to reconvening again fully once 2019 rolls around. Hello Members, Christmas and the end of the year are nearly here and people are getting busier! Contests Many clubs have already run pairs of contests with some deciding to run the contests events that do not require speech preparation and some have stuck with the pair that in the past have been typically run in the latter half of the year. This is the first time we have been without the end of year conference and the changes will take a little getting used to and it may take time to decide what is best for our clubs with respect to what contests when. This time of the year sees the commencement of the second Club Leadership Training round with some Divisions offering training events in early December with further events early in 2019. These sessions offer knowledge and skills that your Club’s officers need to be effective, and provide the opportunity to discuss challenges with your peers. All club Executive officers are expected to attend these training events, however please note that any member may attend. Perhaps your club has members who are considering becoming members of the executive committee next year and want to see what the roles involve? What better way to get started than attend a CLT event, listen to and contribute to discussions around the role. The Hamilton Conference team are working hard to have a great Conference for you! Have you booked your accommodation for the May conference? See you there! Wow, it is hard to believe we are already in December! Take time to sit back and reflect on how much you have grown in the last five months and how much more you may accomplish in the seven months to come. We are pleased to advise that at District Training in November, each of our Division Directors took away two flags for use in each Division. Should you wish to use one of the flags to advertise any club event you are having, please contact your Division Director. Division Directors also collected 18 Visitor Brochures per club that expressed an interest in receiving these brochures. If you have not received your visitor’s brochures yet, please contact your Division Director. Should any club want additional Visitor’s Brochures, these may be applied for via promotional funding applications. (Please contact me or your Division or Area Director should you want assistance in completing a new club, existing or low- membership club promotional funding application form). Toastmasters was represented at the NZ Business Women’s Conference on the 26th – 27th of October 2018 at the Ellerslie Events Centre. A big thank you to Serena Irving for both arranging and assisting with this. Many thanks to Katrina Matich, Genevieve Darlow and Rowena Foster for supporting this event. We will be holding a coaching workshop in the New Year. Please contact me if you are interested in attending this workshop. We have a number of clubs who currently qualify for a club coach. Please do call me if you would like the opportunity to coach a club. Congratulations to First Impressions who celebrated their 30th anniversary on the 24th of November. 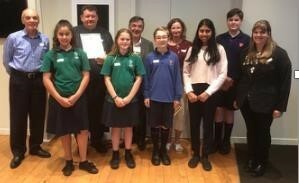 Katrina Matich and Sabrina Naseem represented Toastmasters at the Speech Showcase to celebrate World Compassion Day held at Rotary Birkenhead on Wednesday the 28th November 2018. 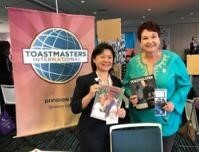 Sabrina and Katrina used their skills gained through Toastmasters to MC the event and to coach some truly inspirational students from Takapuna Grammar and Rosmini College. Watch out for the RUN the RED Toastmasters world project April 2019 !! – Will it involve you?? Available at very 0 cost for photos and short Toastmasters experiences to encourage the world that we are in the right place.